I love Eggplant and make variety of dishes( Vegetarian). 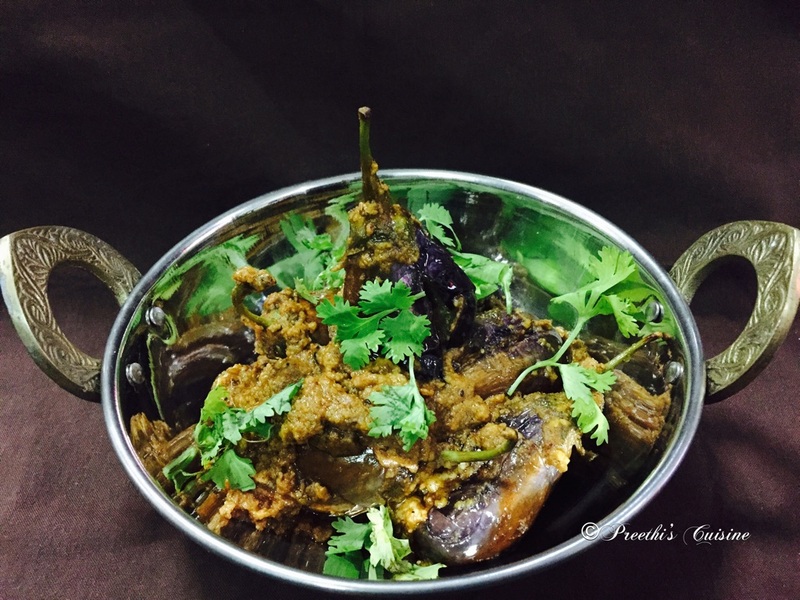 This Eggplant Masala is one of my Favourite recipe as I have made some variation by adding Peanuts which enhances the taste. My Family just loves this recipe of mine. I made this dish on a special request from my cousin who was visiting us. 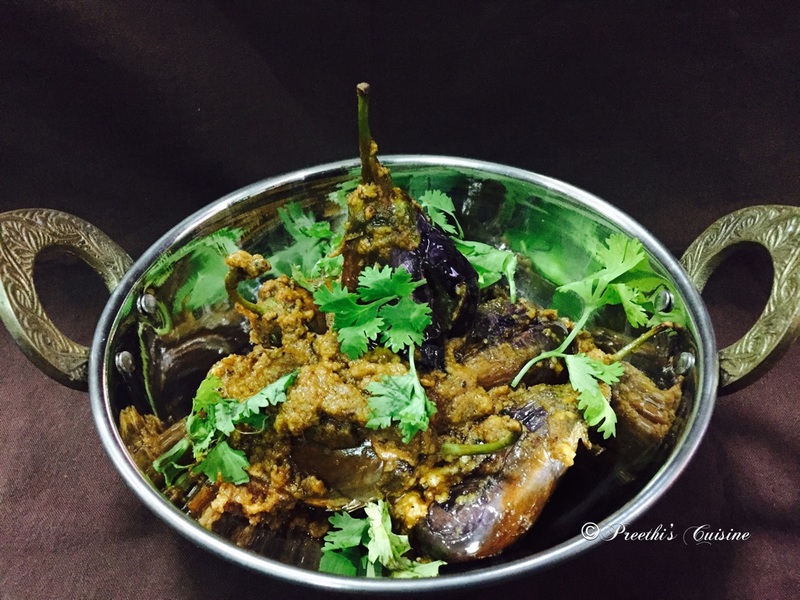 A totally lip smacking dish that will leave you craving for more. It is easy to make and can be thoroughly enjoyed for both lunch and dinner. Dry roast all the ingredients on medium flame separately.Ensure they don’t burn. Allow it to cool. Blend all the ingredients to fine powder. Add salt to taste. Slit the Eggplant into 4 parts and stuff the dry masala generously. Repeat the process for all them. Keep the excess dry Masala aside. Heat 2 Tbsp of oil in a wok. Place all the stuffed eggplants and roast on medium flame till they become tender. Add water to the excess masala and make a watery mixture. 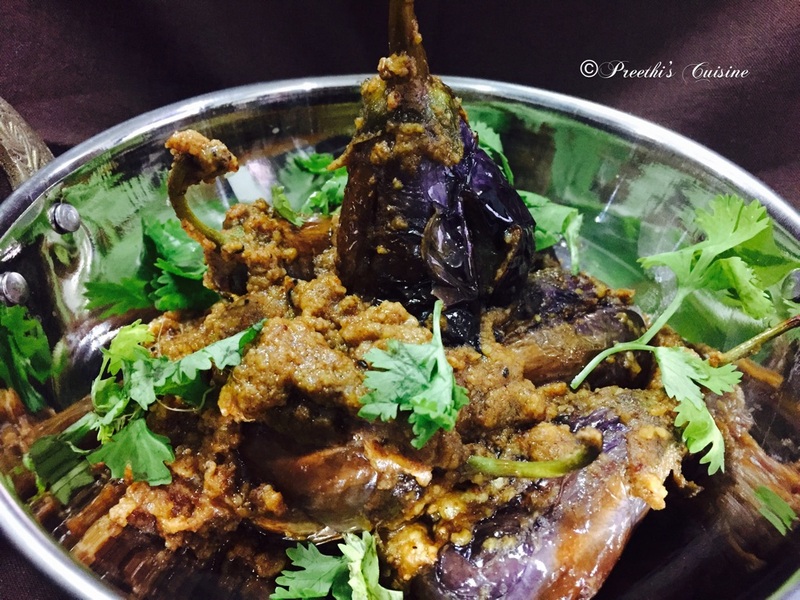 Once the brinjal a are soft and tender , pour this mixture . Add salt to taste . Let it simmer for 5 mins. The mixture will start getting thick . Mix well and switch off the flame. Garnish with Fresh Coriander and serve hot with Phulkas or Rotis.